The March 2011 issue of Super Street Magazine has a feature on the Chassis Stop's 2005 Infiniti G35. 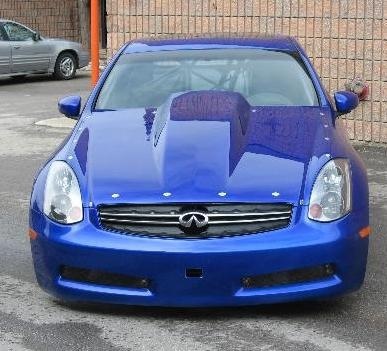 Built in Mississauga, Ontario, Canada this is one serious Infiniti. Sporting the "big block" of the Nissan inline 6 world, the TB48, this particular example has been bored and stroked to 5.2 liters. Right near double the displacement of Nissans well known RB26, there is no replacement for displacement. Horsepower is listed as 1800 whp at 38 psi, and 2500 whp at 55 psi out of the 106 mm Precision turbocharger. Behind the engine is a Liberty 5 speed transmission, and a Ford 9 inch rear end. Import Drag Racing on the West Coast has been pretty slow the last few years, but racers on the East Coast and Puerto Rico still fill venues. In Australia, drag racing seems to still be going strong. A lot of the ex-US race cars end up racing in both Australia and New Zealand. Looking forward to some videos of this thing hunting some 6 second timeslips. Chassis Stop G35 drag car from David Pratte on Vimeo.